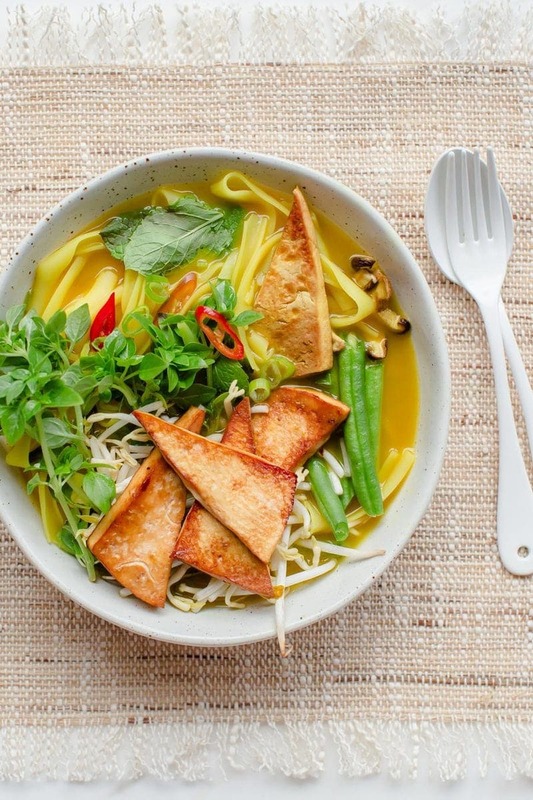 A quick Vegan Pho made with an aromatic broth, spicy tofu, immune-supportive shiitake mushrooms and fresh herbs. Done in 30 minutes making it a nutritious mid-week meal. Pure, slurpy soul food! Pho is a Vietnamese noodle soup. 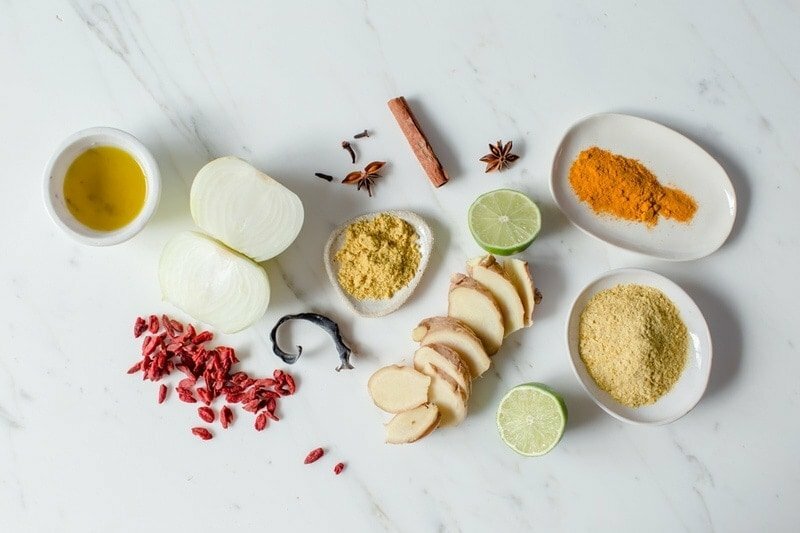 Traditionally, a clear, fragrant broth is made from scratch, which first involves charring ginger and onions over an open flame, to add a sweet but smoky flavour. Then beef bones (along with the marrow, connective tissue, muscle, fat) are boiled and simmered for up to ten hours, with the blackened ginger and onion, toasted aromatics and vegetables. 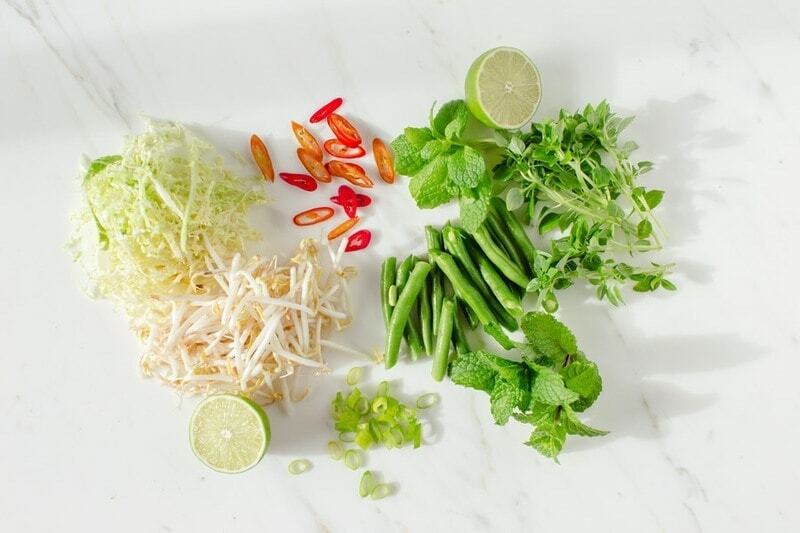 The strained broth is added to bowls with cooked rice noodles, along with a myriad of fresh greens and herbs – bean sprouts, basil, mint, coriander. To serve, a squeeze of fresh lime, and a squirt of sriracha and hoisin sauce for an extra layer of heat and salt. Well, make no bones about it (sorry! ), my version is nothing like the above! 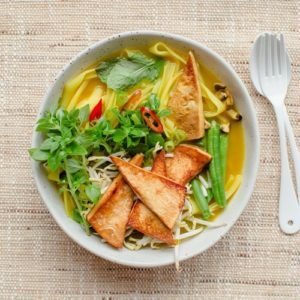 In fact, I desperately wanted to call this recipe, Lauren’s Magical Golden Pho, but settled on a more sensible title in the hope people may stumble across it when searching our old friend Google. Whilst it is always a good idea to make a broth from scratch, allowing it to simmer for hours to infuse and become so flavoursome, I know that this just isn’t realistic during a busy working week. 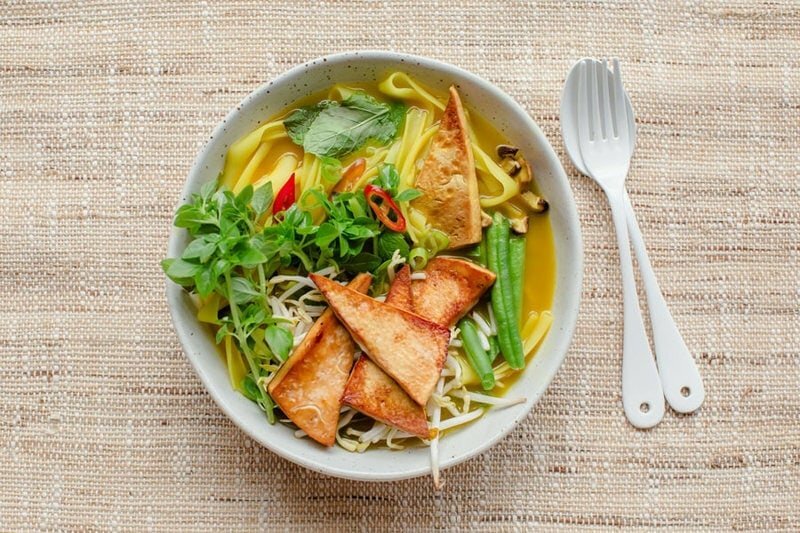 The goji, kombu and turmeric are optional – but I wouldn’t skip the nutritional yeast. Aromatics are herbs that have strong aromas due to their beautiful volatile essential oils. As a class, they tend to work on the gut, lungs and nervous system – but also – your spirit and mental wellbeing. For example, it is the aromatics that are used in ritual and ceremony. Think of incense, burnt as a sacred offering, or to aid in prayer or meditation. In the Catholic church, it is a symbol of the prayers of the faithful rising to heaven – the swinging of that little golden orb sending wafts of frankincense over the congregation. But that is aromatics to a T – they bring movement, shift stagnation, disperse energy and bring lightness. They are traditionally used for both digestive and respiratory congestion due to their spasmolytic and carminative actions. For example, they help to ease spasms in the smooth muscle of the digestive tract, as in colic and irritable bowel syndrome, and to relieve bloating and flatulence (think chamomile, fennel, peppermint, lemon balm, cinnamon, anise, cardamom). They also help relax the lungs in asthma and bronchitis, soothe a chesty cough, and clear mucous (think ginger, thyme and fennel). In addition to the above, aromatics also serve as tonics to the nervous system. They are uplifting and shift stagnation – used traditionally for anxiety and low mood (think lavender and lemon balm). Most of these are things you’ll have in your pantry, spice rack or garden – make the most of them! 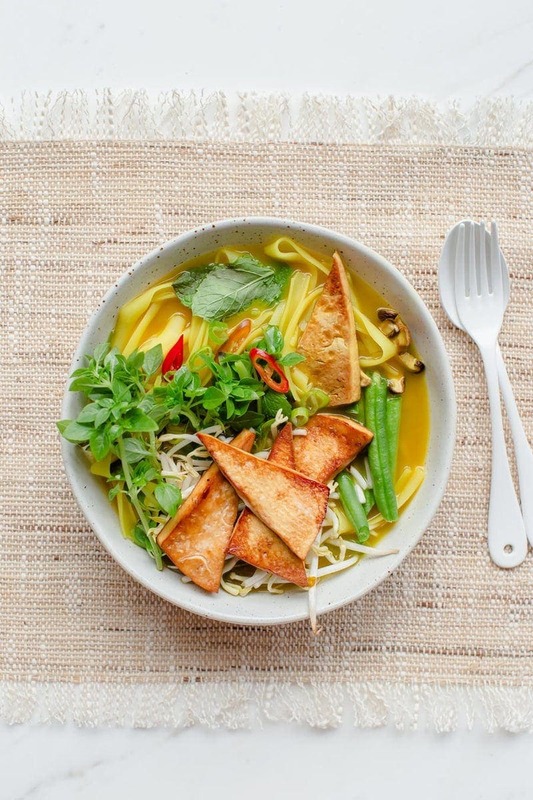 A bowl of nourishing vegan broth filled with rice noodles, shiitake, tofu and fresh herbs. You will need a cheesecloth or a nut milk/sprouting bag to strain the broth once cooked. Add spices to a large stock pot and dry roast till they release their aroma - just don't let them burn. Add nutritional yeast, ginger, onion, olive oil, stock powder and water – and goji, kombu and turmeric if using. Bring to a boil, reduce to a simmer (uncovered), and cook for 25 minutes, reducing it down to about 3 cups. 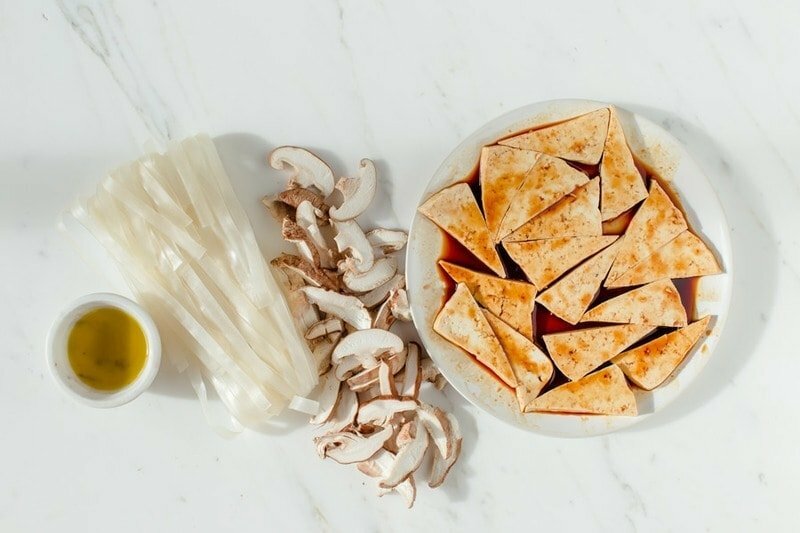 Slice tofu into triangles – the whole block – you won’t need it all but may as well cook and enjoy leftovers. Marinate in tamari and srirachi for as long as you’re able, then lightly pan-fry both sides in olive oil. Set aside. Slice shiitake fine, lightly pan-fry, set aside. 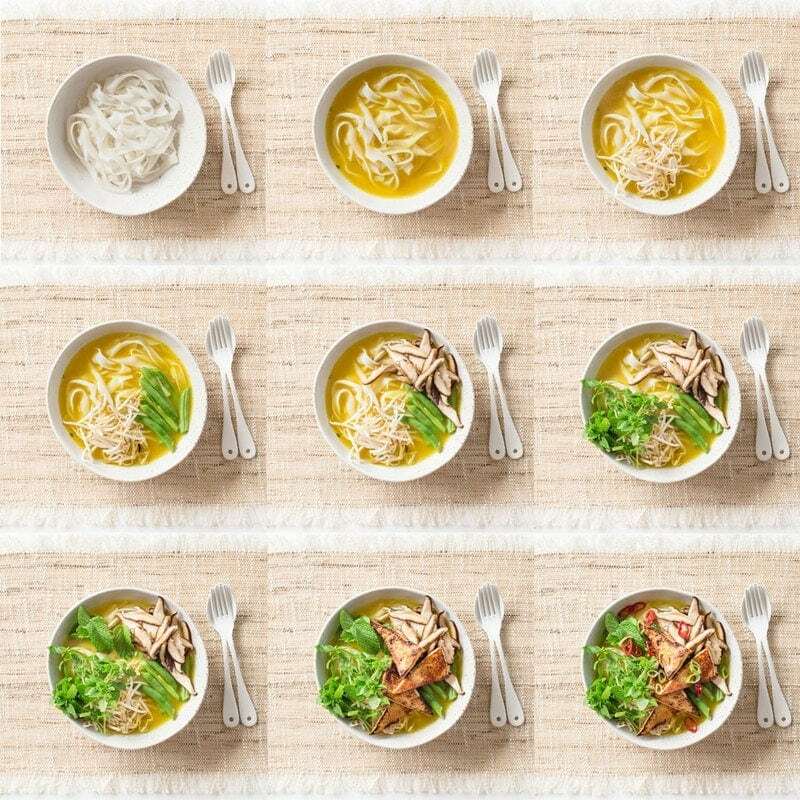 Cook rice noodles in boiling water for a few minutes till soften, then drain and rinse. Divide into two and place in serving bowls. Once broth has cooked, strain all ingredients through a fine mesh bag – a cheesecloth or a nut milk/sprouting bag is ideal. Discard all the ingredients. Add a dash of tamari and juice of 1 lime to finish. Divide broth between the bowls, add all fresh toppings, shiitake and tofu. Enjoy! You can use liquid stock if you like – perhaps 2 cups stock and 4 cups water. Make it IBS/SIBO friendly – omit the yellow onion, cabbage, beans and bean sprouts – add in finely julienned carrot and more herbs instead. If you are a messy eater (me!) – have a napkin handy – the broth is bright yellow and may stain clothes if it splatters.